To Lumineers or Not to Lumineers? I’ve gotten two smile makeover recommendations from two different dentists. I’m hoping you can break the tie. I live in another city so I know you won’t be swayed to try to get my business. The first dentist said I was a good candidate and recommended I do porcelain veneers. The second dentist also said I was a good candidate but suggested I do Lumineers. He said they’re better because you don’t have to grind your teeth for them. Which would you recommend?? I’m going to muddle the issue. I think you’re asking the wrong question. But, before I give you the question you should actually be asking I want to clear up a couple of common misconceptions. First, Lumineers are porcelain veneers. They’re just a brand of ultra-thin porcelain veneers. They’re not even the only brand of ultra-thin veneers. Most people know about them because they’re so highly advertised. Second, when it comes to any brand of porcelain veneers, your teeth won’t have to be ground down. That’s what happens when you get a dental crown. 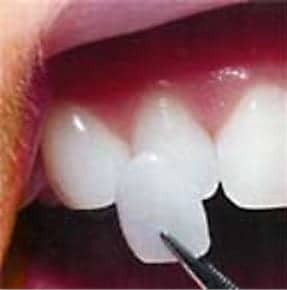 With many brands of veneers, you simply have some mild shaving done so the teeth won’t look bulky. The amount of tooth structure removed amounts to about the depth of your fingernail. Instead of which brand should you get, you should ask about how to find the right dentist. The reason for that is you can have two dentists do the exact same smile makeover with the exact same brand and the smiles will turn out differently. Each dentist has a different level of technical skill and artistry. You want an artist who can give you a gorgeous smile no matter which brand you choose. Picking the right dentist has become simpler in recent years. One reason for that is the mynewsmile.com website. If a dentist asks to be listed on their site as a cosmetic dentist, they don’t just list them. Before they can be added they have to demonstrate they have the training, technical knowledge, and artistry to be considered an expert cosmetic dentist. As far as training goes, dental school isn’t enough. They’ll have to have spent many hours in post-graduate training specifically related to cosmetic work. So, my advice to you is to go on the mynewsmile.com website and look up expert cosmetic dentists in your area. Then, let the dentist pick the brand he thinks will work best with your particular smile goal.